If I hear “It’s the will of the British people” one more time **************!!! Actually it’s the will of one wavering voter in every fifty. While in the European project Britain has lurched from one social or economic disaster to another, leaving us much weakened, but nearly every one has been an own goal. Our signings up of wingers Nigel Lawson, Tony Blair, Jack Straw and David Cameron (among others) have proved very expensive and so we’ve been relegated. Who got me started on this? I did. What is the UK to do if (as is quite likely) the vote is 51% to 49% in either direction? (Not far out, eh!) But David Dimbleby’s grossly irresponsible “We’re Out!” on the night of the referendum appears to have pre-empted all debate on its authority. As always, here are some links to the inexpensive how-to-do-it Lattice Labyrinths workbook which is available from the publisher or you-know-who , or from a good independent bookshop or via Google. Mention Pythagoras and Pythagorean triangles spring to mind, but his theorem is really about the area of certain squares (regular polygons with four sides) and sums of their areas, which happens to relate to the sides of the aforesaid triangles. 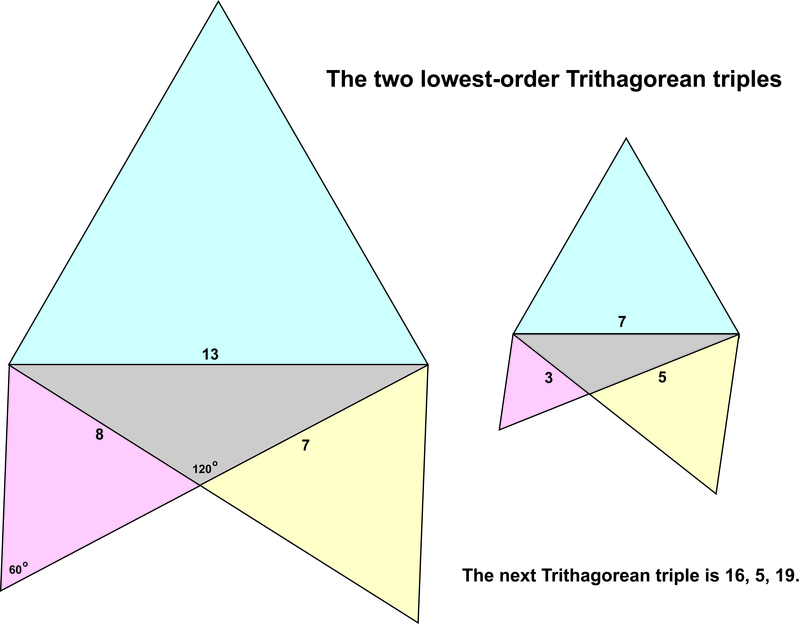 The forgotten Trithagoras discovered a beautifully analogous theorem which really is about the area of triangles, certain equilateral triangles (regular polygons with three sides), and the sums of their areas. It’s fun to derive both theorems using complex numbers displayed on the Argand diagram. If you have not clicked off at the mention of complex and Argand, hello again. Firstly, here are the presentation slides as a Powerpoint, Trithagoras.Rev. Possibly easier to understand than slides without words there follows a rather long-winded explanation; far more conscientious than could be included in the presentation at the MathsJam 2017 conference at the likeable conference centre Yarnfield Park, where the five minutes maximum duration was humorously but rigorously enforced. But first let’s look at a perhaps unfamiliar way of generating PYTHAGOREAN triples -the three integral sides of right-angled triangles. 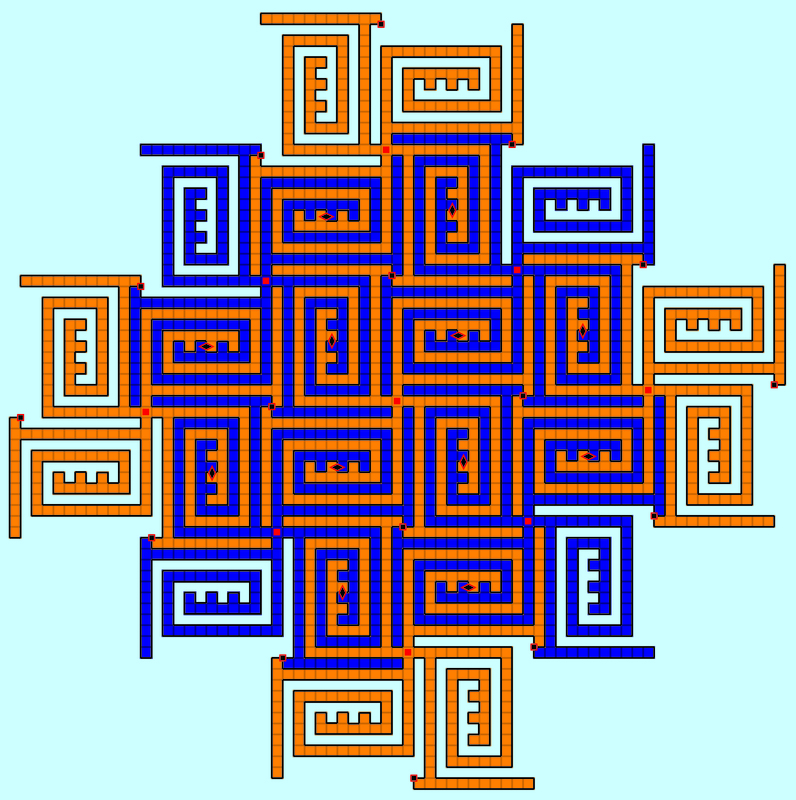 The complex number 8 + 3i, for instance, can be represented as a point with coordinates (8,3) on the Argand diagram. It also represents a vector connecting this point with the origin with length (the modulus of the complex number) √(8² + 3²). You can see from the diagram below how this can specify the figure of a square of area (8² + 3²). Note that, in general, complex numbers (a,b) where a and b are integral are known as Gaussian integers (see the diagram below). The next figure below illustrates the procedure for multiplying two complex numbers, in this case (3,2) and (4,1), to get their product, (10,11) and how that is equivalent to multiplying together two square figures, of areas (3² + 2²) and (4² + 1²) to produce a product square of area (10² + 11²), which equals (3² + 2²) x (4² + 1²). I bet you will not resist checking that this multiplication works. 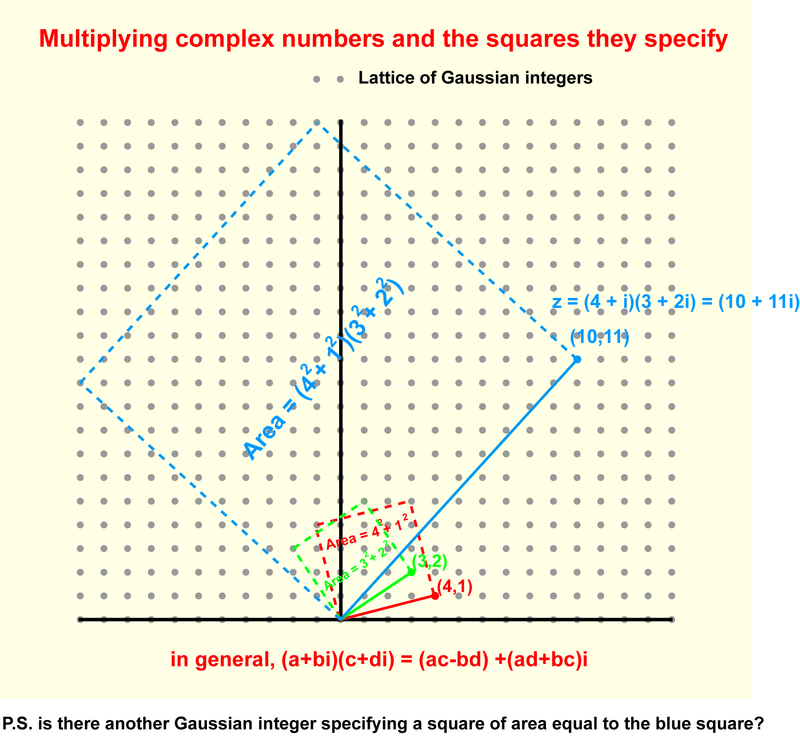 Now suppose we take a complex number (a,b), that is a + bi, and multiply it by itself, in other words square it. The result is the complex number ((a² – b²), 2ab), specifying a product square figure of area (a² – b²)² + (2ab)². In the figure below I have chosen to illustrate the specific case (2,1) the smallest Gaussian integer (a,b) for which a ≠ b ≠ 0. Now suppose we switch the real and imaginary coordinates to get the number (b,a). on the Argand diagram the means we have equivalent to reflected (a,b) and its vector about the diagonal line at 45 degrees to the real (x) axis. 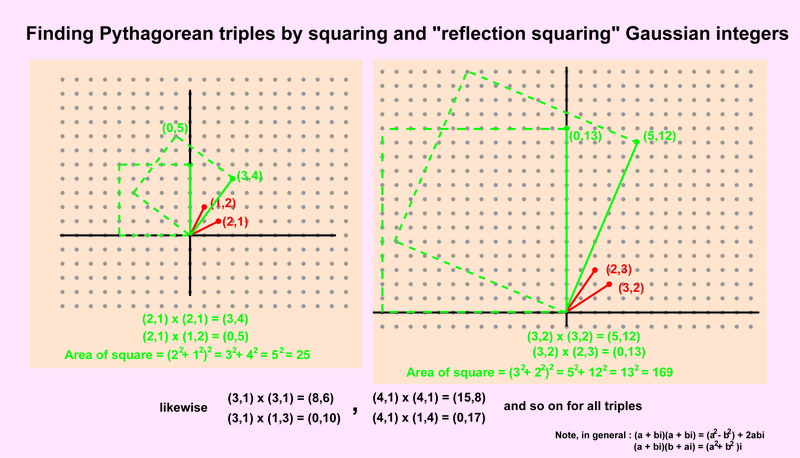 Suppose we multiply (a,b) by (b,a); you could call this reflective squaring. This time the product is (0, (a² + b²) which having a zero real part is represented by a point lying on the imaginary (y) axis of the Argand diagram. This has to be the case as, when you multiply two complex numbers you multiply their moduli but ADD their arguments, that is the angles their vectors make with the real (x) axis. As the vectors of (a,b) and (b,a) are symmetrical about a 45 degree angle, their product must have an argument of 90 degrees. (Thanks to John Read of Nottingham MathsJam for pointing out what I hadn’t noticed). For (2,1), the reflective product is (0,5). As the modulus (vector length) of (2,1) is obviously the same of that of (1,2), the product square of the reflective squaring must have the same area as that of the squaring, so 3² + 4² must equal 5², and so, of course, it does. We have found the lowest order Pythagorean triple 3,4,5. So many words – below are just two pictures that tell it all. And here is the familiar figure, linking the triples to their corresponding Pythagorean triangles. 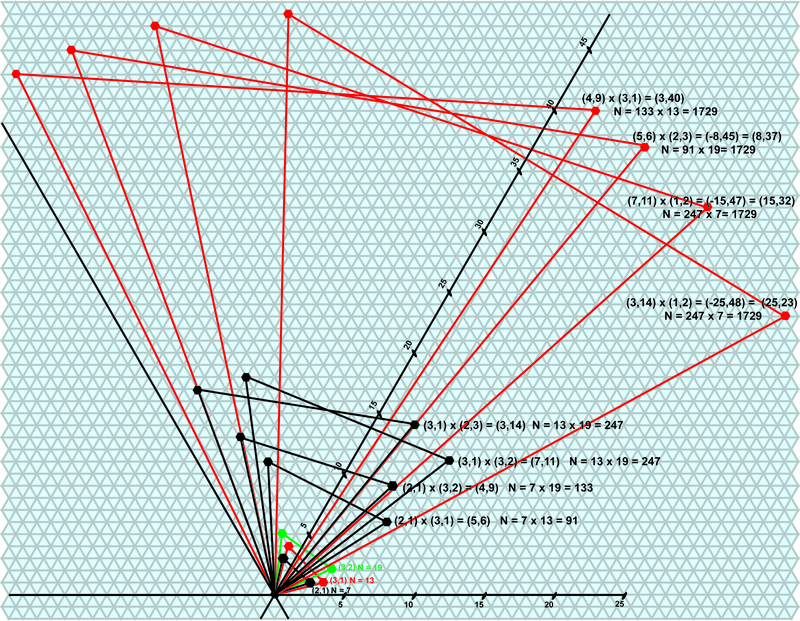 All the Pythagorean triples can (with some complication in a relatively few special cases) be found in this way. Before moving on to Trithagoras, it’s interesting to see what happens if we multiply two DIFFERENT complex numbers, and then reflection multiply them. 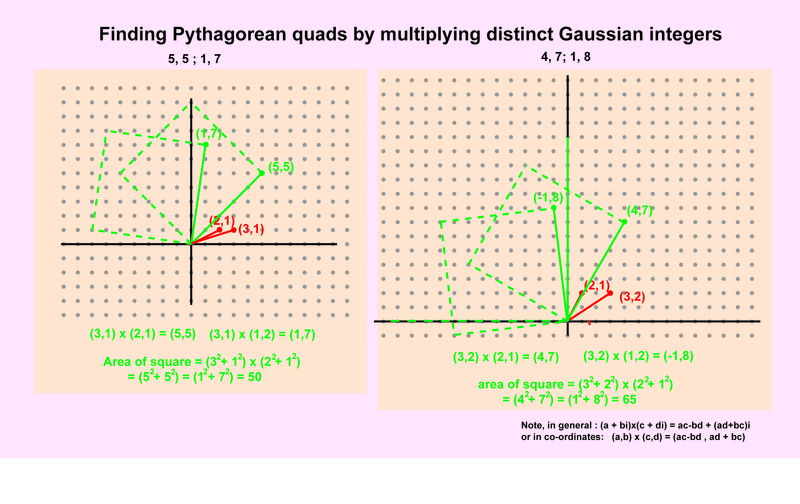 You can call the result Pythagorean quads, a,b;c,d specifying complex numbers (a,b) and (c,d) such that (a² + b²) = (c² + d²). The figure below shows how this relates to Pythagorean triangles; we now have not one right-angled triangle with squares constructed on its sides but two right-angles triangles which share a common hypotenuse, no longer itself of integral length. So, (10,15) being essentially the same as (15,10),we now have three pairs of squares, with the same sum. Carrying on this way, we can eventually find the smallest number, 1105, which is the sum of FOUR different pairs of squares. It is no coincidence that 1105 has factors 5,13 and 17 – the hypotenuses of the first three primitive (excluding multiples of lower-order cases) Pythagorean triangles. We follow the same procedure for equilateral triangles as we have just employed for squares. 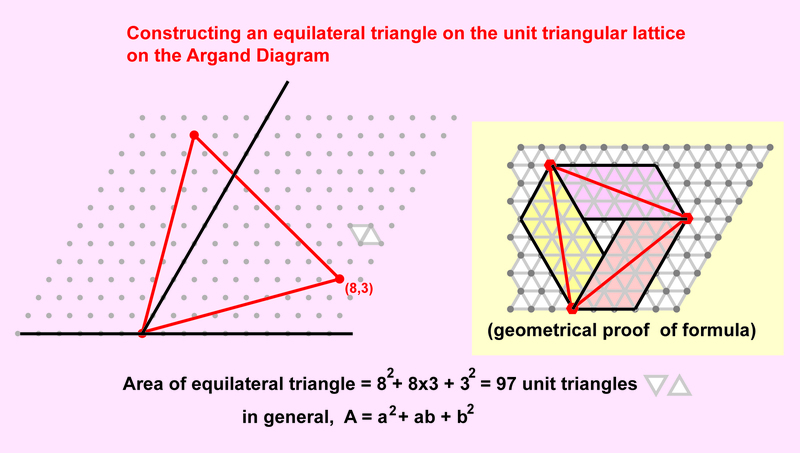 First of all how we construct an equilateral triangle on the Argand diagram. 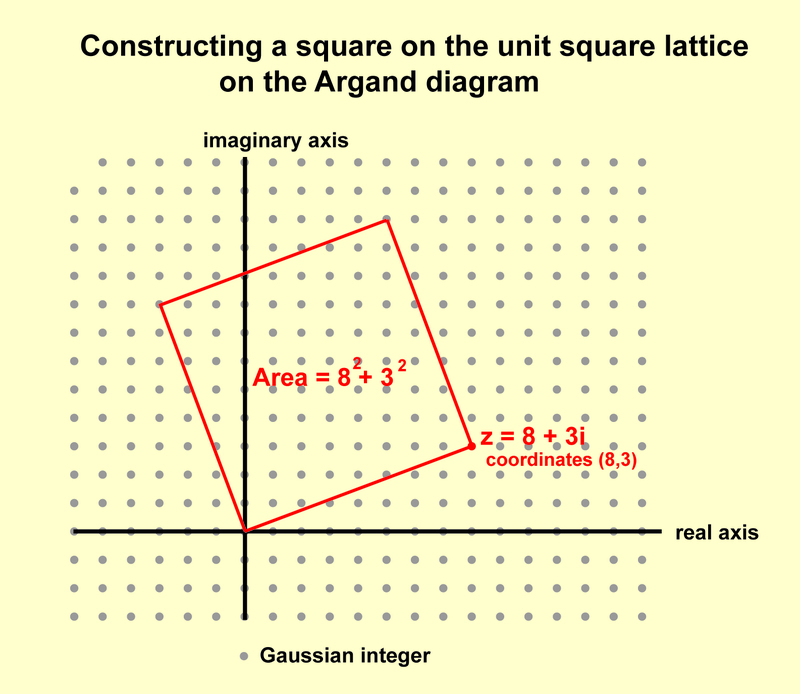 As you can see, I’ve set out the unit triangular lattice on the Argand Diagram. The points shown are the equivalent on the triangular lattice of the Gaussian integers that make up the unit square lattice. They are known as Eisenstein integers. They are integral with respect to the axes at 60º but the real and imaginary parts of an Eisenstein integer (a,b) are (a + b/2) and b.√3/2. This affects the rule for multiplying two Eisenstein integers (see below). (((Experts need to ignore the insignificant annoyance that Eisenstein used axes at 120º; I don’t because to do so would introduce inelegant and vexatious negatives. Inelegant because, using Eisenstein’s axes, the area of a triangle works out as a² – ab + b²; vexatious because thus the modulus of a point on the lattice (and the corresponding triangle area does not increase monotonically as a and b increase, an increase in b can cause the modulus, and triangle area to decrease ))). The above figure shows how, analogously to multiplying squares on the square lattice we can multiply equilateral triangles on the triangular lattice. Remembering that the real and imaginary parts of (a,b) are (a + b/2) and b.√3/2. we can slog through the algebra and find that the rule for multiplying together two Eisenstein integers (a,b) and (c,d)and the triangles they specify is (a,b) x (c,d) = ( ac-bd, ad+bc+bd); we have an extra term, bd, over and above the Gaussian formula. 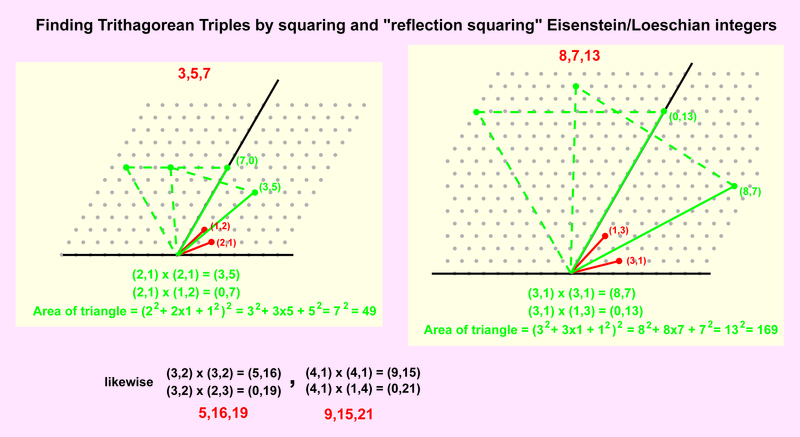 Now we can see what happens when we square and reflection square a single Eisenstein integer and the corresponding triangle. We’ve generated in each case two triangles with the same area, but one having a zero coordinate, yielding TRITHAGOREAN TRIPLES, the equivalent for equilateral triangles of Pythagorean triples for squares. Below you see the equivalent of the classic Pythagorean triangle figure for Trithagorean triples. The beautiful property of these figures is that as for instance 3² + 3×5 + 5² = 7², the area of each big blue triangle equals the sum of the areas of the two smaller triangles PLUS THE AREA OF THE GREY TRITHAGOREAN TRIANGLE ,the analogy to the Pythagorean triangle that links three squares. and the figure below shows how these triangles can be related together. Now we have not a single grey triangle in the middle, but two, sharing their longest side, analogous to the sharing of a hypotenuse in the Pythagorean case.Trithagorean triangle diagram above and analogous to the quads figure in the Pythagorean half of this post. a² + ab + b² = c² + cd + d² = e² + ef + f² = g² + gh + h² = 1729. Apart from its famous property of being the lowest number that is the sum of two positive cubes in two different ways 1729 = 7 x 13 x 19, the product of the three lowest primitive Trithagorean “hypotenuses”, just as in the corresponding Pythagorean case we had 1105 = 5 x 13 x 17. The correspondence raises the intriguing question as to whether 1105 has at least one other very special property. Ramanujan would have instantly tendered an answer. I would love to hear from a reader what his answer might have been. No wonder I didn’t get through all that very clearly in five minutes at Yarnfield Park. PS These days almost all the known properties of almost any number can be found by checking with the On-Line Encyclopedia of Integer Sequences. Entering 1105,1729 into the search field comes up with ten sequences in which these appear consecutively – most of them closely related. In particular they are the second and third lowest Carmichael numbers https://oeis.org/A002997 and the first and second lowest numbers which are pseudoprimes both to base 2 and to base 3, https://oeis.org/A052155. The Lattice Labyrinths workbook is available from the publisher or you-know-who , or from a good independent bookshop or, if clicking on these makes you anxious, via Google. 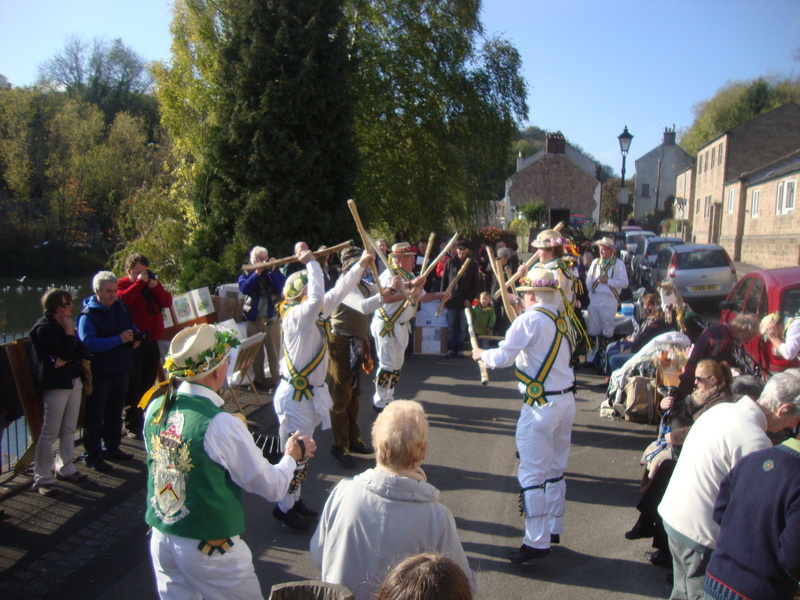 The 2017 Wirksworth Festival, in Derbyshire, England, runs from 8th until 24th. 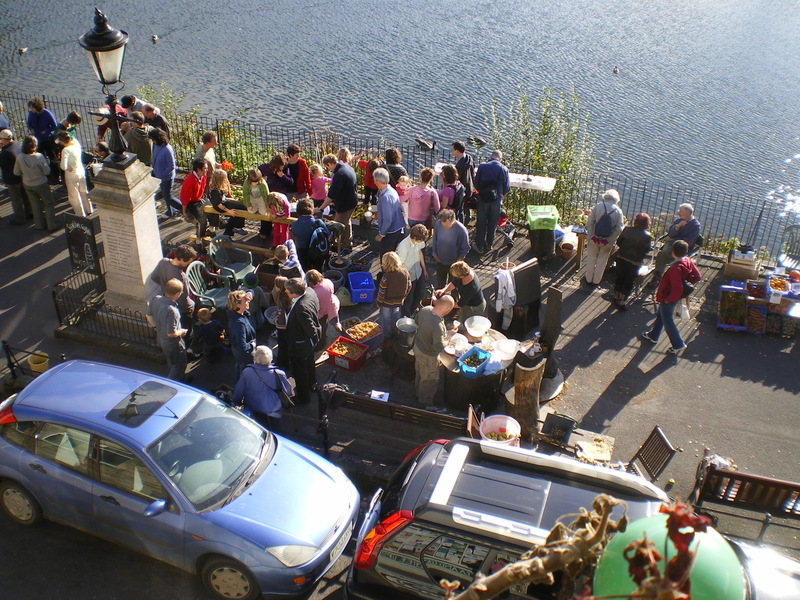 September.perhaps its most successful feature is the Art and Architecture Trail, 10 till 5 on Saturday and Sunday, 9th and 10th. September. This has grown over the years into an event that attracts artists from a wide area to exhibit in an amazing and entertaining variety of public rooms, business studios, private homes and outdoor spaces. 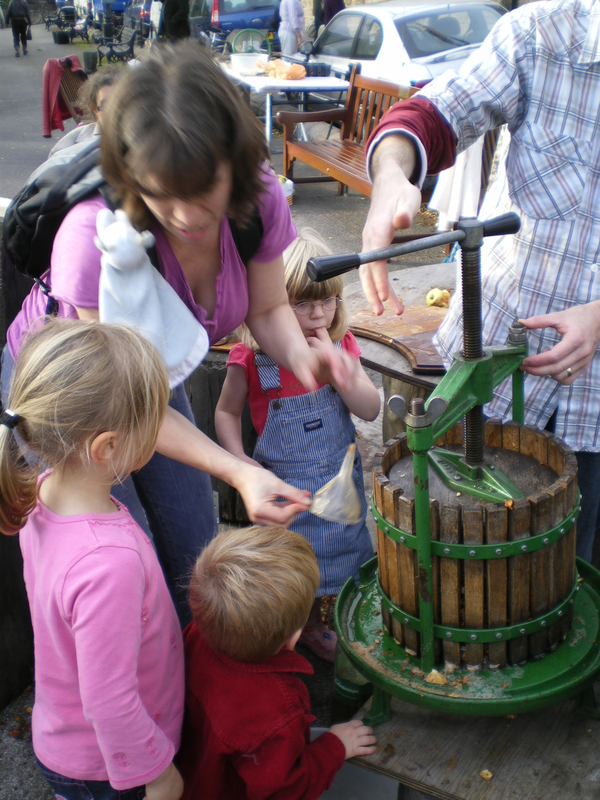 Add in crowds and street music and you have the atmosphere and stimulation of a mini Edinburgh Fringe. Exhibited below is an impression of my contribution, which will be assembled under a gazebo on the lawn behind the Memorial Hall. 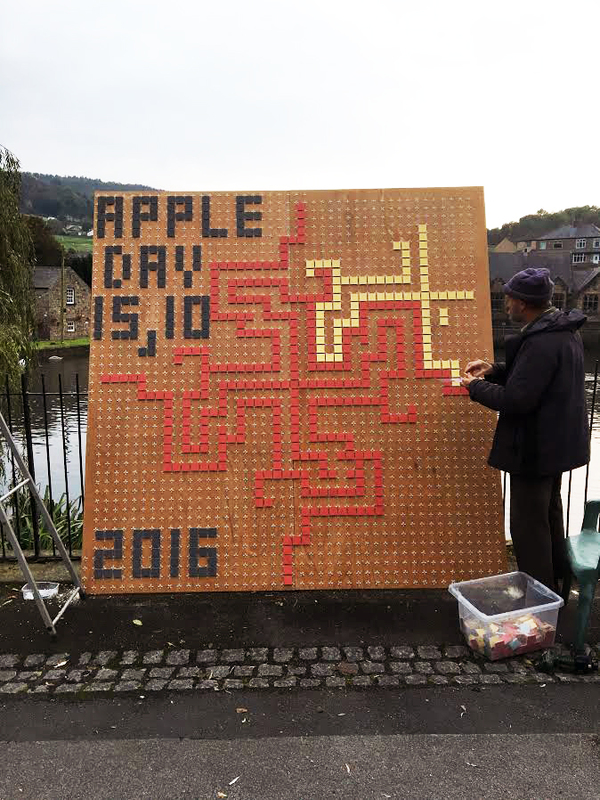 As in 2016, a tessellation is realised on two 8 ft by 4 ft (2.4m by 1.2m) boards and once again employs the number pair (8,9), 8th. 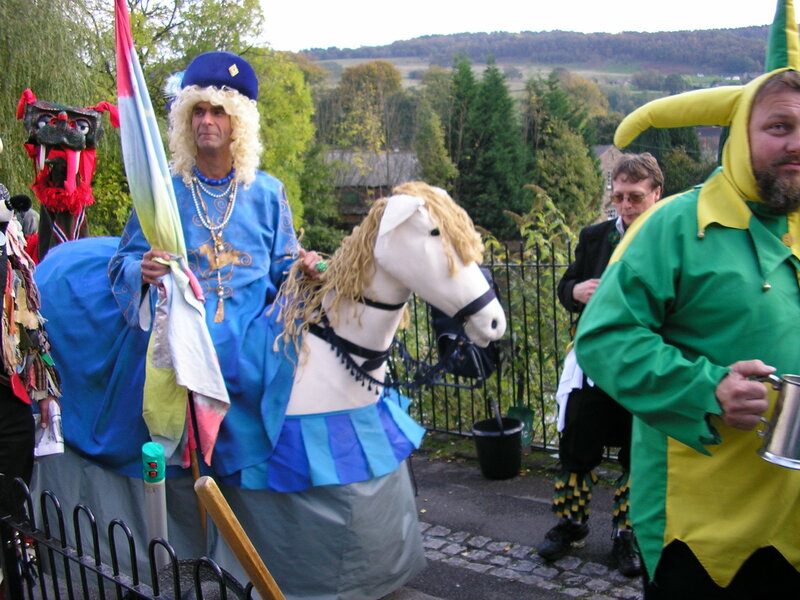 September being not only the patronal festival of St. Mary’s Church Wirksworth, but also of Notre-Dame de Die. 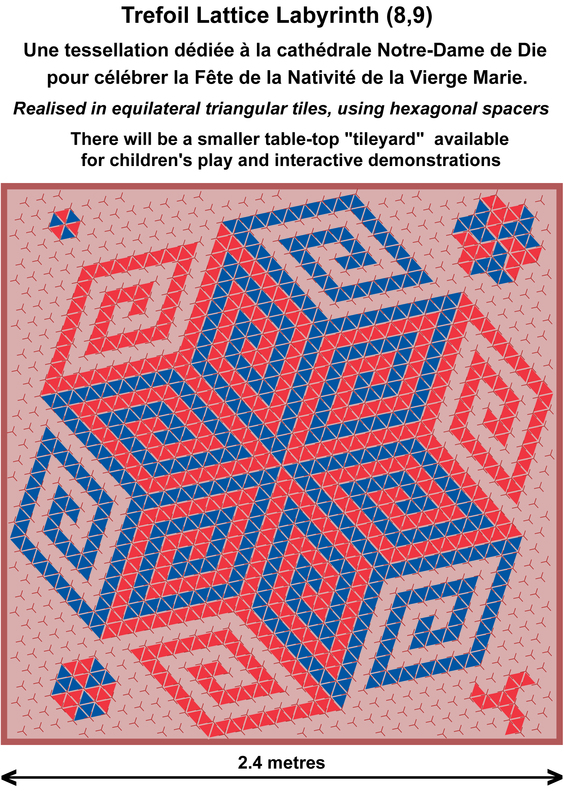 But this year it’s a tiling of equilateral triangles, not squares – a trickier practical project. ..but, writing on Tuesday 5th. September, the question is, “Will it be finished in time?” the snapshot below give some idea of the 99% perspiration involved. Thanks to Kwik Split for supplying Raimondi hexagonal tile dividers – a rare breed. 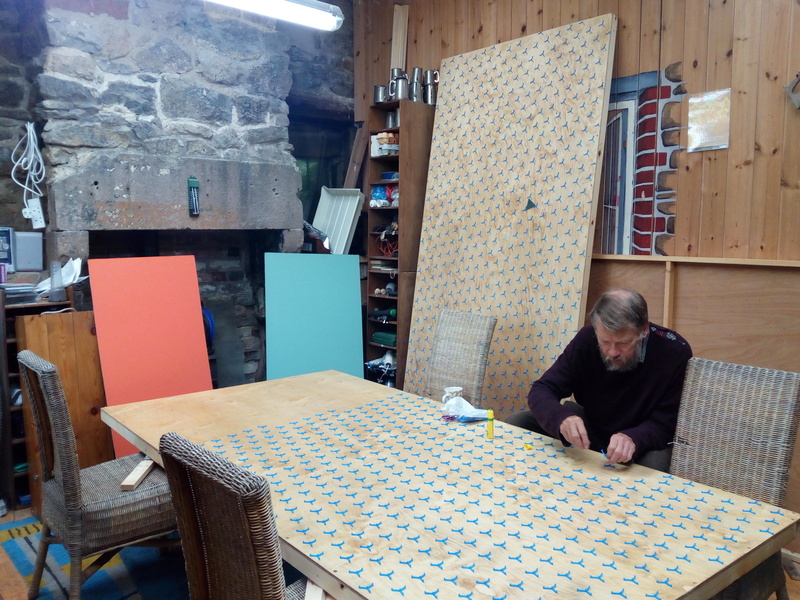 Furthermore, as I write my good friend Jacob the Joiner, busy with Middleton-by-Wirksworth community endeavours, is still to cut up the 6 x (64 + 72 + 81) = 1302 equilateral triangles needed, from mdf boards (plywood would spall under the saw), two of which are to be seen above, each anointed with seven coats of paint, two of which are “magnetic”. The time is ripe to prototype laser-cutting from metal sheets. Update of Thursday 7th: the redoubtable and obliging Jacob Butler has nearly finished cutting the triangles. Here he is at work. 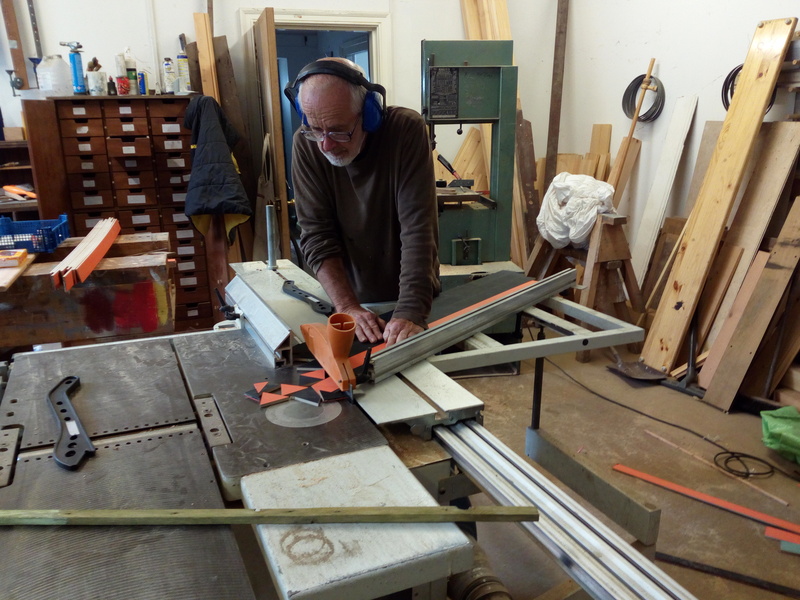 First the boards are cut into strips, then fed in to the saw again, about five strips at a time at a 60 degree angle. 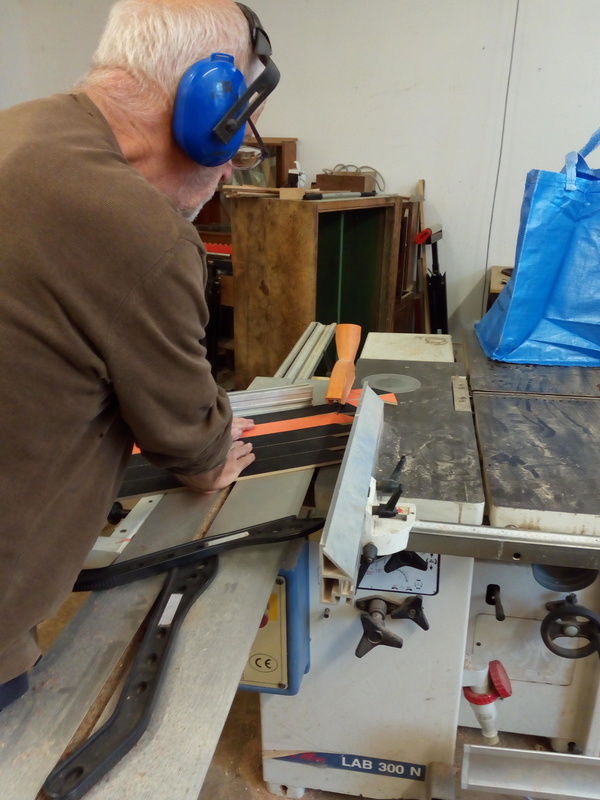 After each cut, each strip is turned over and…hey presto! Jacob’s table saw is an excellently solid and accurate piece of kit, but not surprisingly, however, he recommends I root out a CNC (Computer Numerical Controlled) router next time. The last time he experienced such repetitive tedium was when Harrod’s ordered 100 (was it?) identical wooden toy trains. 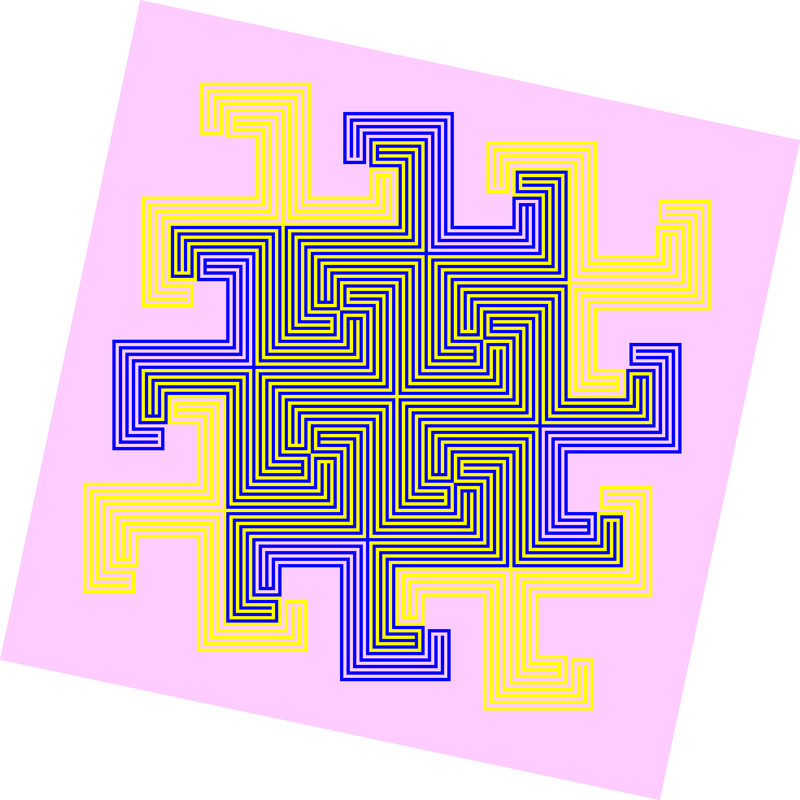 Here is Trefoil Lattice Labyrinth (32,15). There’s something rather special about it. According to the celebrated story, the English mathematician G.H.Hardy arrived at the hospital bedside of his Indian protege ( the autodidact mathematical genius) Srinivasa Ramanujan in London taxi number 1729, which apparently uninteresting number Ramanujan immediately pronounced to be the smallest number than can be expressed as the sum of two positive cubes in two different ways, 1729 = 9³ + 10³ = 12³ + 1³ ( the nearest possible miss to a case of x³ + y³ = z³, declared impossible in the even more celebrated “Last Theorem” of Pierre de Fermat). Several other elegant attributes of 1729 are outlined by Wikipedia, but their compilers have, at the time of writing, missed one more property: 1729 is also the LOWEST number which can be represented by a Loeschian quadratic form a² + ab + b² in FOUR different ways with a and b positive integers. (a,b) can be (25,23), (32,15), (37,8) or (40,3). 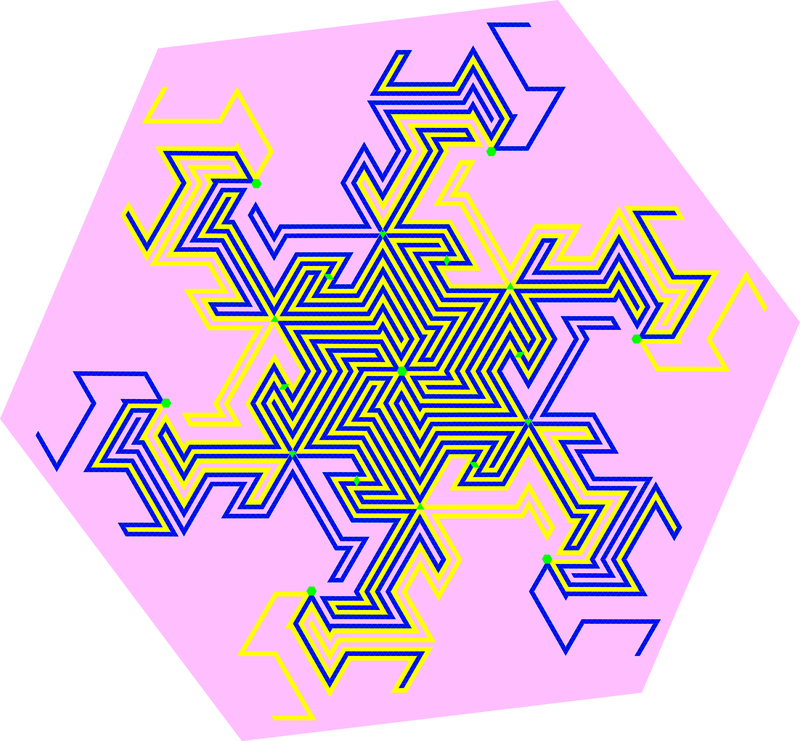 I personally discovered this to my amazement when looking up 1729 in my list of Tessellatable Numbers up to 2100. 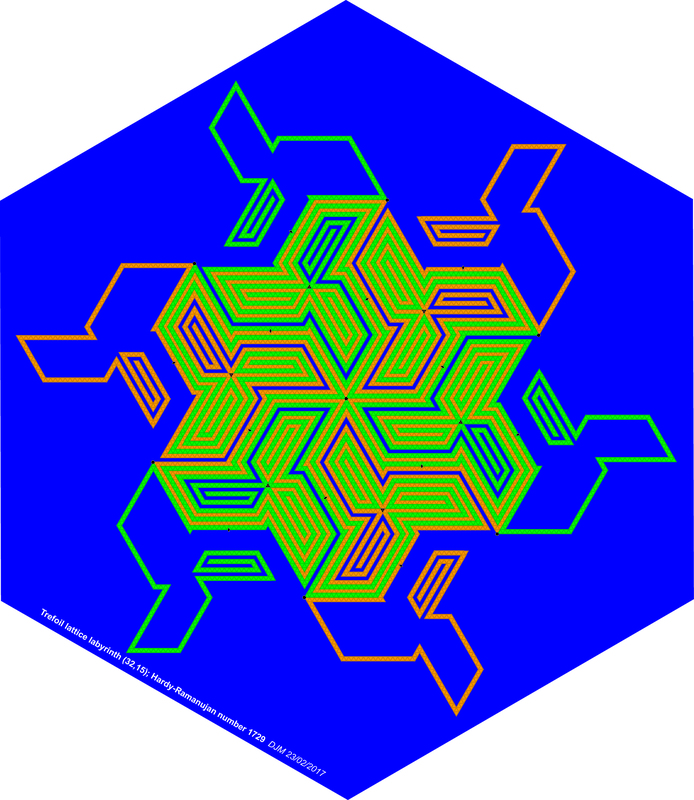 If you’ve read other posts on this blog you will realise that my interest in numbers pairs is that they form the separation parameters for setting out tessellations on the square or triangular lattices. 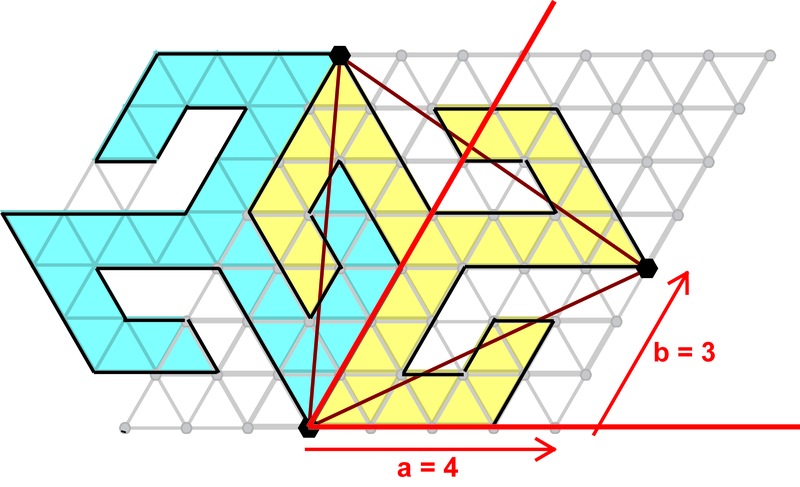 Here’s what I mean for the triangular lattice case where (a,b) is (4,3). The area of the red triangle, set out according to separation parameters (4,3) measured parallel to the red axes at 60° to each other = 4² + 4×3 + 3² = 37 triangles (for a non-rigorous geometrical derivation of how this comes to be the case see a previous post on this blog). 37 is also the area of each of the two “supertiles”, the yellow and the blue, shown. 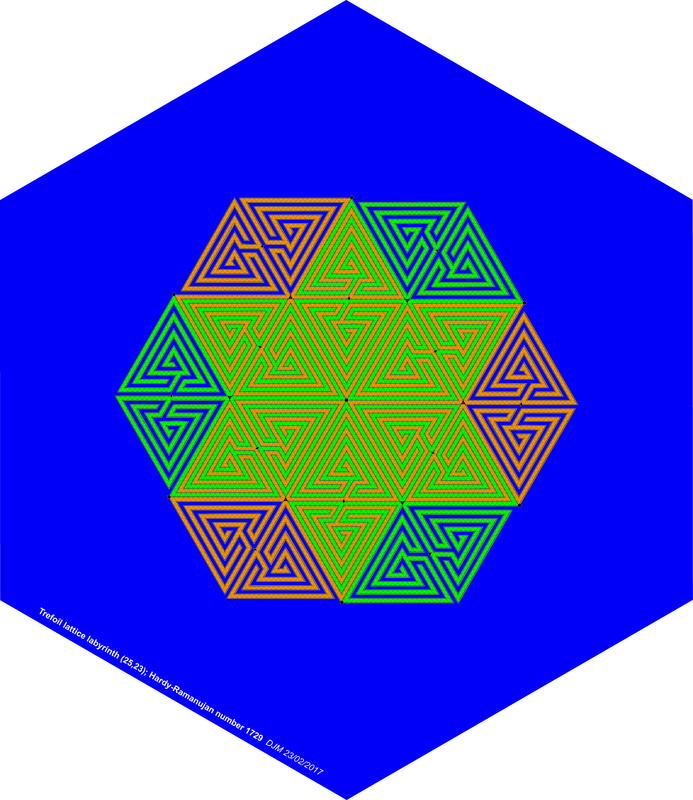 Together they make up the repeat unit or fundamental domain of the Trefoil Lattice Labyrinth (4,3) tessellation of the infinite plane. 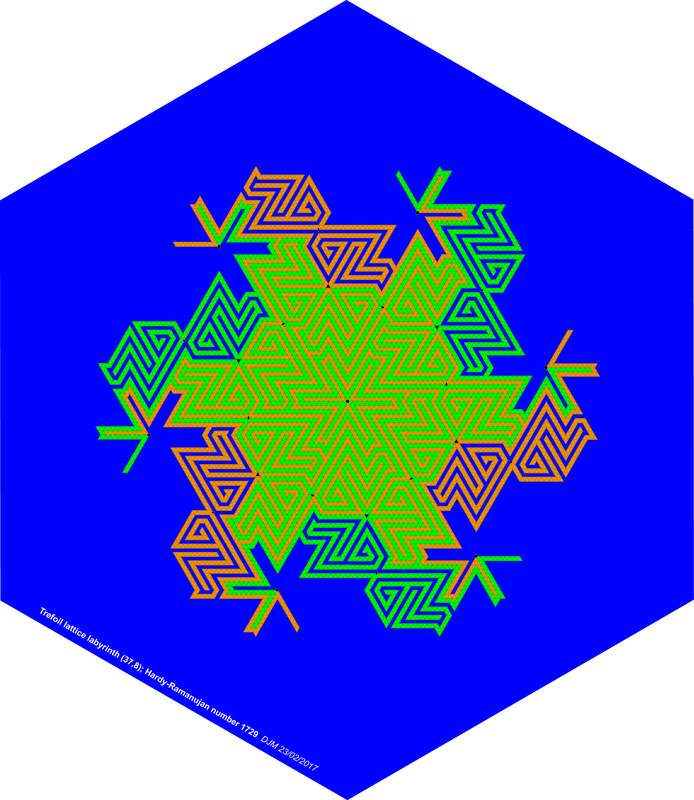 37 is what I mean by a “tessellatable number”, of which 1729 is another example and is the area of each supertile of tessellations set out using any of the number pairs (25,23), (32,15), (37,8) and (40,3) as the separation parameters. How does this remarkable extra property of the Hardy-Ramanujan Number arise? Let’s see what arises if we multiply some separation parameter pairs together. 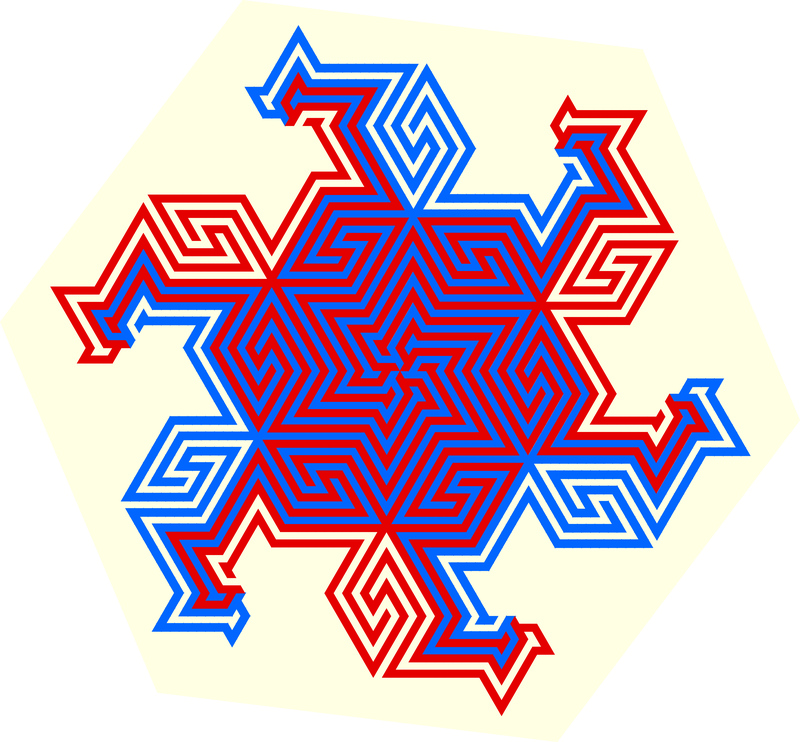 The number pair (2,1) is PRIME; its only factors are itself and unity, which on the triangular lattice is (1,0). 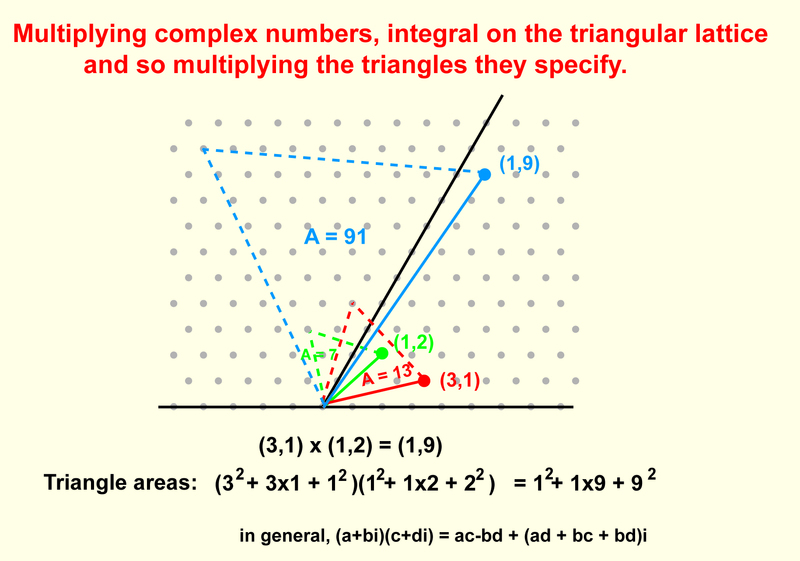 Note that the triangle area it specifies is 2² + 2×1 + 1² = 7. If you multiply it by itself (“square it”), (2,1) x (2,1) you get (5,3) with a corresponding triangle and supertile area of 5² + 5×3 + 3² = 7 x 7 = 49. If you multiply itself by its mirror reflection (think of the triangle in the above figure reflected across either axis), (2,1) x (1,2) you get (0,7) also with triangle area 7 x 7 = 49. The general expression for multiplying number pairs (a,b) and (c,d) on the triangular lattice to get (m,n) is: (m,n) = (ac-bd)(ad+bc+bd). This expression is derived in the aforementioned previous post, where the numbers pairs are treated as specifying complex numbers on the Argand diagram, the Loeschian a² + ab + b² being the norm of (a,b) referred to axes at 60° (the imaginary part of the number is still that measured along a y axis at right angles to the real x axis). Apologies if I’m confusing you as well as myself. 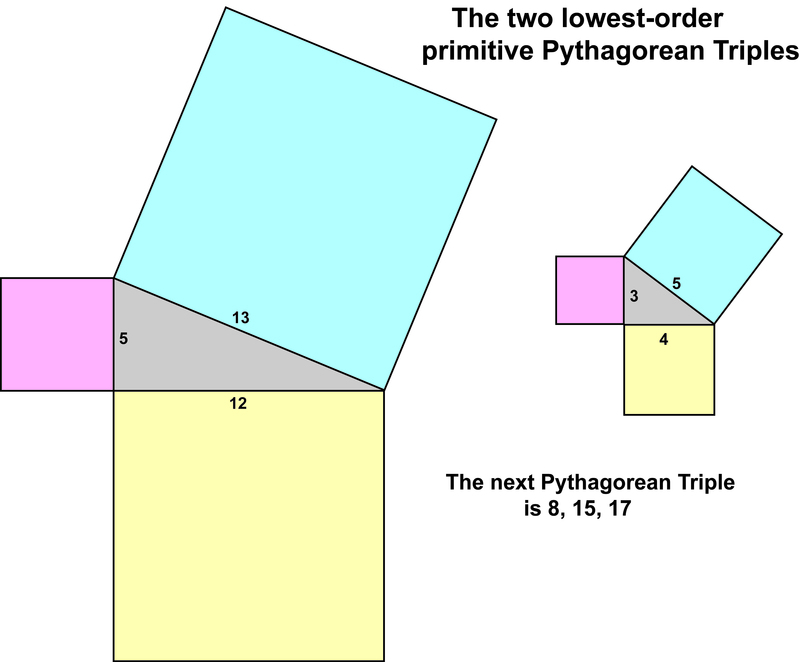 I call 3,5 and 7 a Trithagorean triple by analogy with Pythagorean triples such as 3,4,5. For the derivation and geometric implication of Trithagorean triples see that same previous post yet again. 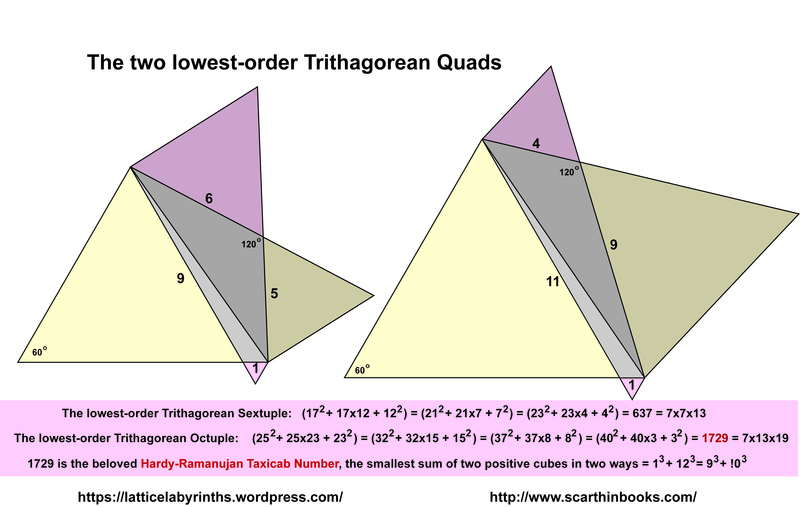 Below I repeat from that post an illustration of the geometric meaning of the lowest-order Trithagorean (or ??????? ?an) triple, compared and contrasted with the ubiquitous lowest-order Pythagorean triple. 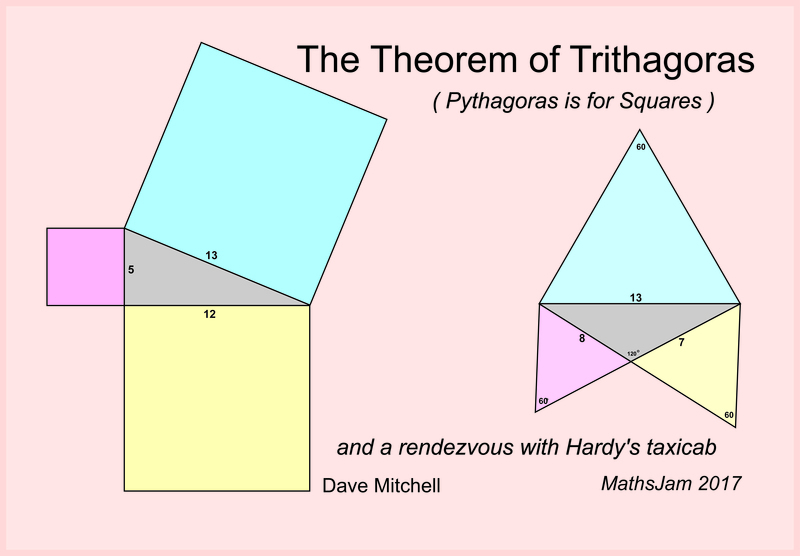 The lovely feature of the Trithagorean case is that the sum of the areas of the pink, yellow AND grey triangles equals the area of the pale blue triangle. (2,1) x (2,1) = (5,3) and (2,1) x (1,2) = (0,7). Trithagorean triple 3,5,7. Likewise (3,1) x (3,1) = (8,7) and (3,1) x (1,3) = (0,13). Trithagorean triple 7,8,13 and (3,2) x (3,2) = (5,16) and (3,2) x (2,3) = (0,19). Trithagorean triple 5,16,19. You may not be surprised, by now, to find that 7 x 13 x 19 = 1729. To see why 1729 can be represented by four different number pairs we need to do some more multiplying. To arrive at a number pair with Loeschian number 1729 we need to multiply each of the above three prime number pairs together. There are eight different ways of multiplying all three together if we include their mirror-image pairs, but four ways are enough to generate the four different representations of 1729 (the other four generate the mirror pairs, with the numbers in each pair interchanged). I list them below, with the negative integers that turn up converted into positive integers by the rule “replace – a by a and b by b-a”. You can check algebraically that (-a)² + (-a).b + b² = a² + a(b-a) +(b-a)² or check this geometrically when you plot the separation parameters on the triangular lattice. 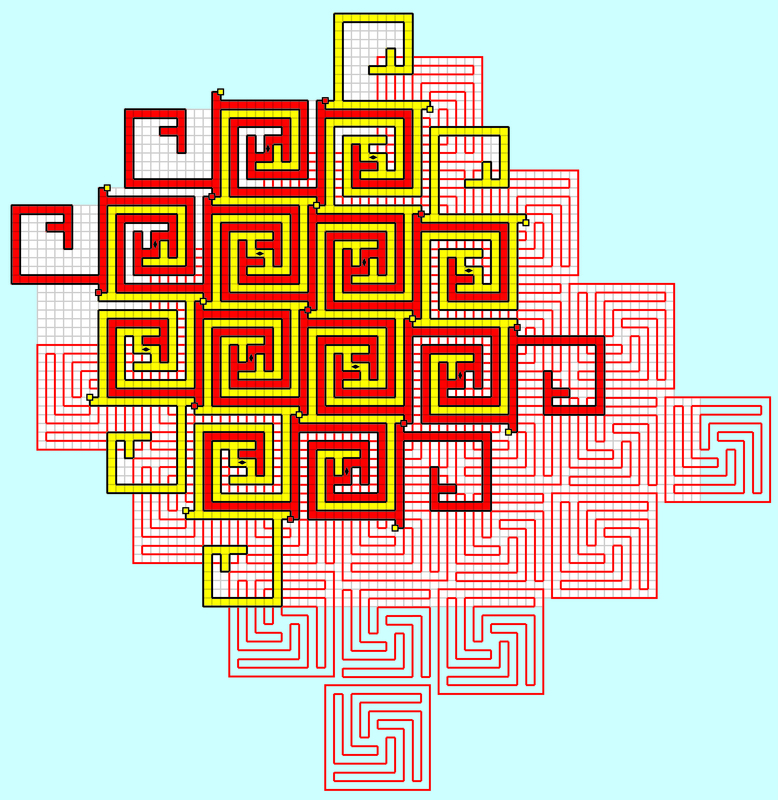 I’ve chosen to show the geometry of the multiplications in red because they fit conveniently onto the compact graph below. Just one sibling seems to be of a quiet and retiring disposition. Ramanujan is taken to be the epitome of the autodidact, but I think that long months of work in solitude has been a necessary part of the (self-) education of all great and many of us far-from-great thinkers. I recommend extracting the next-lowest triangular lattice prime number pairs (the parameters unequal and neither zero) from my table of Tessellatable Numbers up to 2100 and seeing how multiples of their Loeschian number norms correlate with members of the integer sequence A198775 Numbers having exactly four representations by the quadratic form x^2+xy+y^2 with 0<=x<=y of which the Hardy-Ramanujan number is the first member. 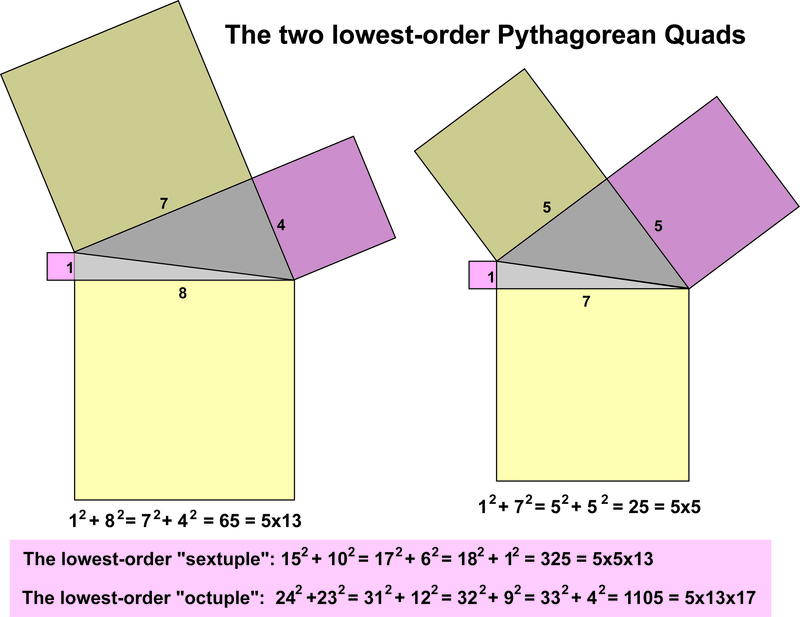 Hummm – and what do you get if you multiply the lowest order PYthagorean norms? This unexpectedly wayward shape is in fact generated by an elegantly simple missing-links graph which I arrived at only by a hit-and-miss evolutionary process – a metaphor of last year’s wayward results of evolved democratic processes? We had better re-cap to sketch out why 2011 and 2017 yield tessellations, but 2012, 2013, 2014, 2015 and 2016 do not, but by all means skip or speed-read the next two paragraphs if you like and go straight to some images of tessellations on the square lattice. 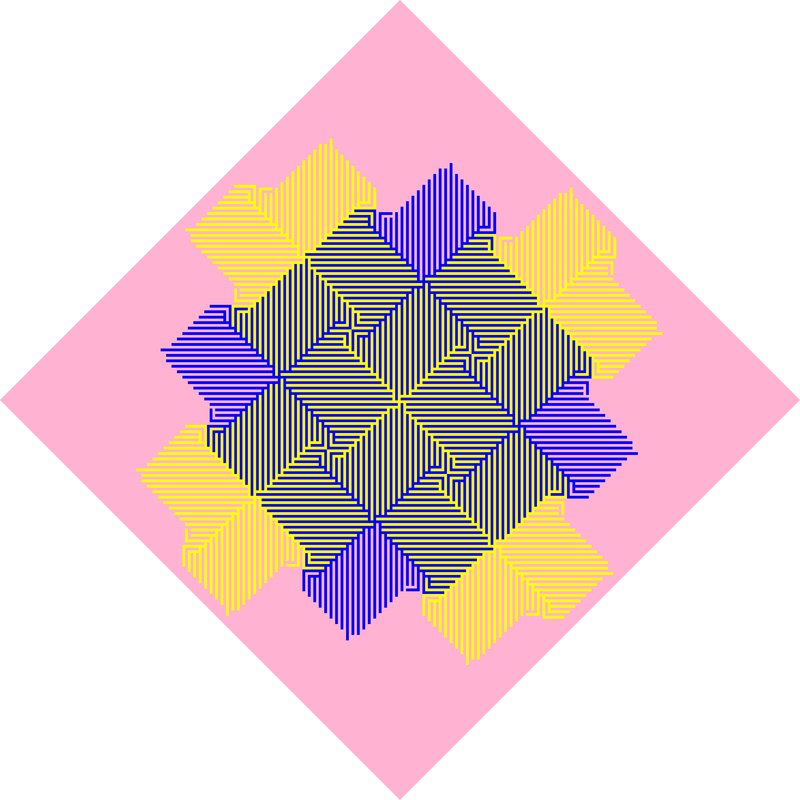 To construct a tessellation on the square lattice we set out points by counting a along one axis and b along the other, forming squares of area a²+ b², so for a number, such as 2017, to be the area of the repeat unit (fundamental domain) of a tessellation on the square lattice it is necessary that it can be partitioned into the sum of the squares of two integers, a and b (one of which may be zero). This is possible only if the number in question is of the form 4m, 4m+1 or 4m+2, never of form 4m+3. 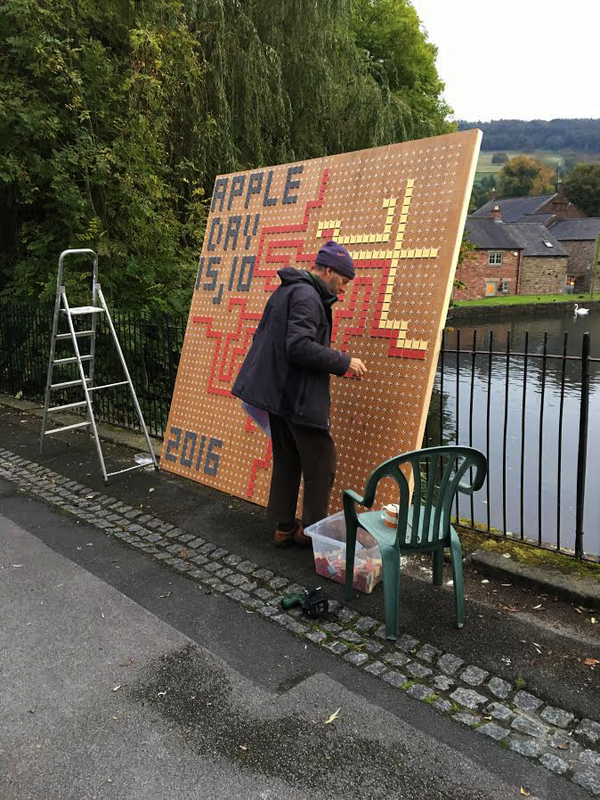 You can get a feel for why this is the case by drawing dots in square arrays or sticking matchsticks in a pinboard. Less obvious intuitively, it is also necessary that all the number’s prime factors (raised to whatever power they occur) must also be of one of the allowed forms. (See Conway and Guy’s Book of Numbers (expensive in paper). For instance, if 3 is a factor, or 3³, no tessellation is possible because both these powers of a prime are of form 4m+3, but if 3² is the factor, this presents no problem, as we can see that 9 can be expressed as 2m+1 where m=4. For tessellations on the triangular lattice we set out points counting e and f along axes at sixty degrees to one another, and the area of the triangles so constructed will be the Loeschian number e² + ef + f². There is an analogous rule for the form of Loeschian numbers. All are of form 3n or 3n+1, never of form 3n+2. Again, you can get a non-rigorous feel for this by counting points or matchsticks set out in triangular arrays. Once again, this rule applies not only to the number itself but also to all its prime factors, raised to a power if it occurs as such. So 2 or 2³ cannot be factors of a Loeschian number but 2² can be, as 4 can be expressed as 3n+1, where n=1. Note that the “tessellatability test” is a member of that beguiling but frustrating family of theorems that tells you whether something exists but includes no method of deriving it. One has confidence that e and f exist (there may be more than one possible pair) but get no further help towards finding them. 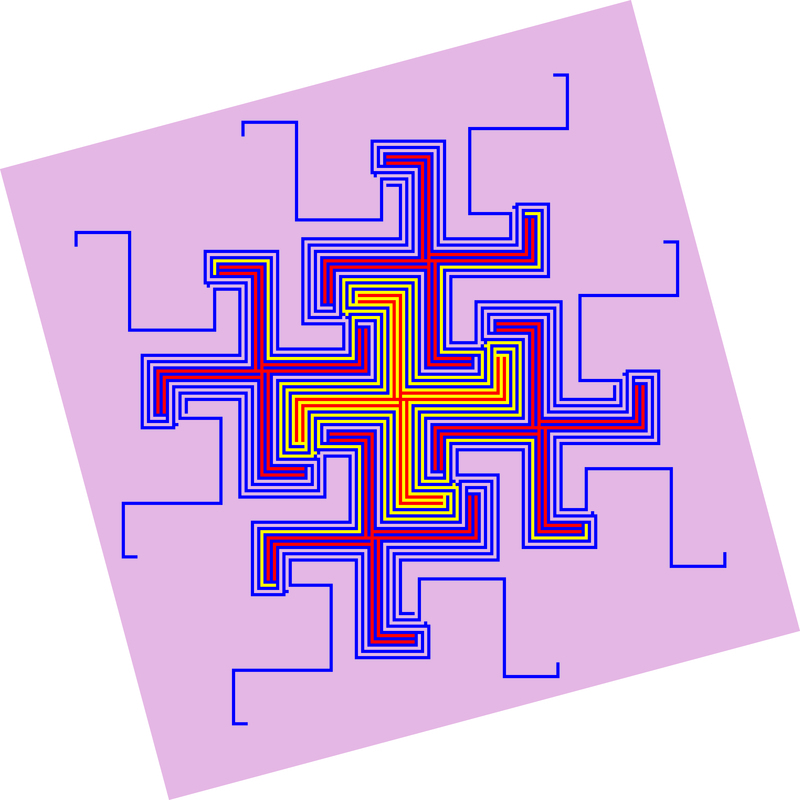 2011 is a prime number and of the form 4m+3 so cannot be the sum of two squares, but it is of form 3n+1 so can be a Loeschian number e²+ef+f² and a Trefoil Lattice Labyrinth can be constructed (I believe – I’ve yet to try) with e=39, f=10. 2013 = 3 x 11 x 61 and both 3 and 11 are of form 4m+3 while 11 is of form 3n+2. 2014 = 2 x 19 x 53 and 19 is of form 4m+3 while both 2 and 53 are of form 3n+2. 2015 = 5 x 13 x 31 and 31 is of form 4m+3 while 5 is of form 3n+2. 2016 = 25 x 3² x 7 and 7 is of form 4m+3 while 25 = 32 is of form 3n+2. 2016 has 36 factors: 1, 2, 3, 4, 6, 7, 8, 9, 12, 14, 16, 18, 21, 24, 28, 32, 36, 42, 48, 56, 63, 72, 84, 96, 112, 126, 144, 168, 224, 252, 288, 336, 504, 672, 1008, 2016. leading me to think that 2016 might be a “highly composite number”, the smallest number to have 36 factors. But no, according to Wikipedia ( donate!) 1260 is the relevant highly composite number, the lowest with 36 factors. One observes that 1260 is an anagram of 2016. The highly composite number that comes first to my mind is 24, the lowest number to have 8 factors. One observes that 42, an anagram of 24, also has 8 factors. 2017, a prime of the form 4m+1 and 3n+1, so we should be able to construct tessellations on both the square and the triangular lattice. 2017 = 44² + 9², corresponding to Chinese Lattice Labyrinth (9,44) (my convention is to put the odd number first) and 2017 = 41² + 41×7 + 7², corresponding to Trefoil Lattice Labyrinth (41,7) (oddness and evenness are not especially significant for the construction, so I put the largest number first), a realisation of which heads this post. 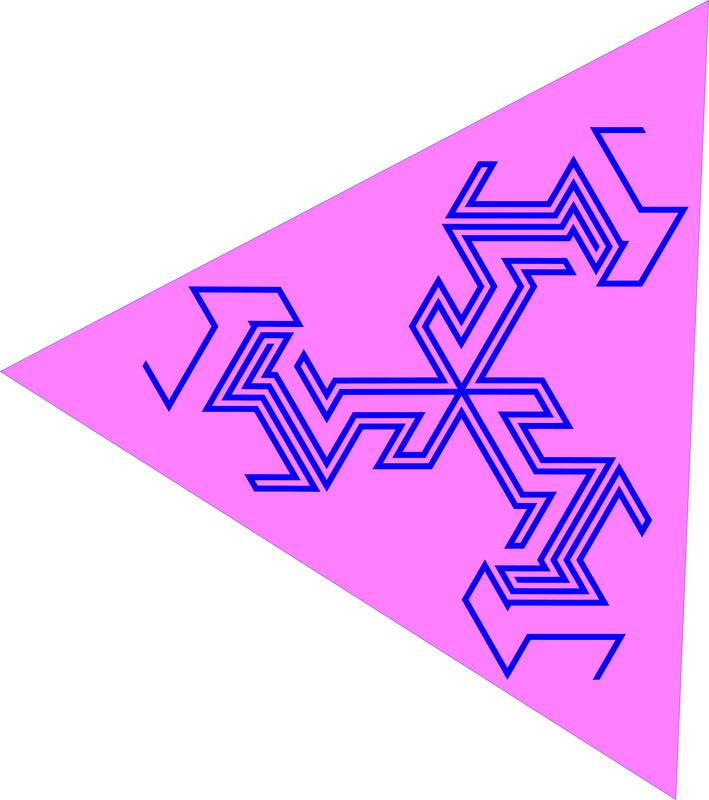 – very (left-leaning) swastikoid of course. 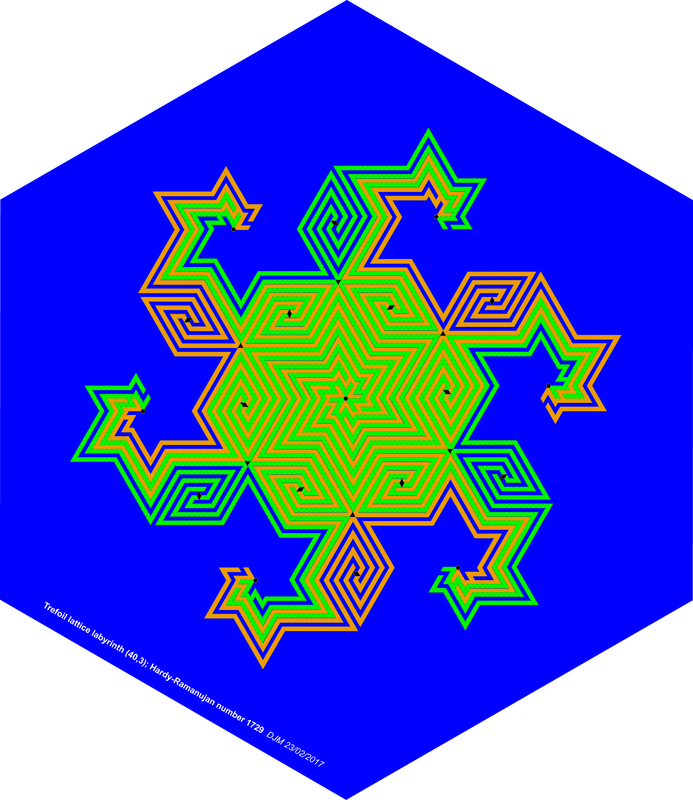 I’ve used three colours to distinguish the (two) different shapes that make up the tessellation, but two colours would do, yellows being surrounded by blue and vice versa. 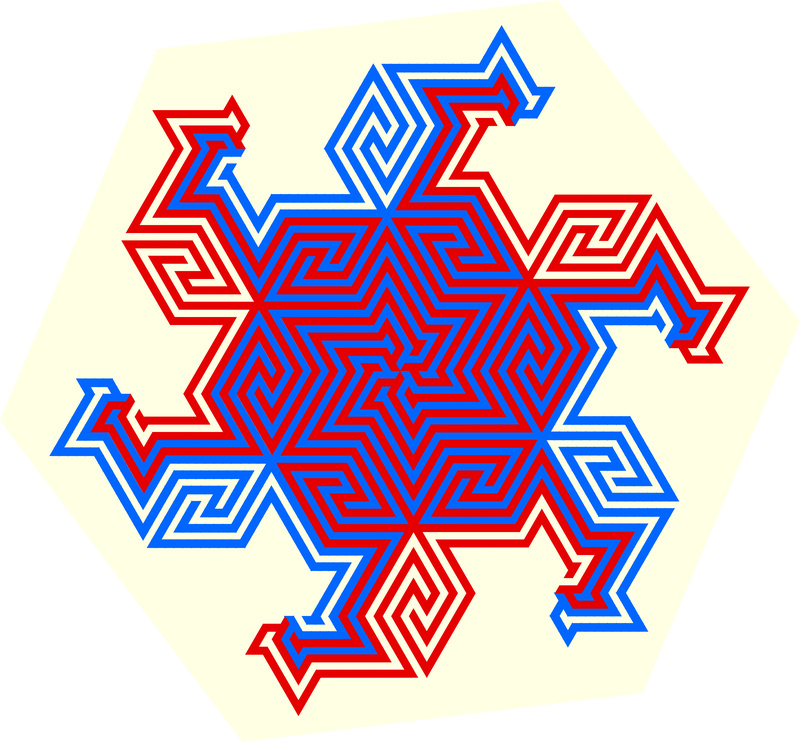 Eventually, I arrived at a successful tessellation, but still reminiscent of a shape disgraced in Western eyes, though there is no such problem in South East Asia. and finally, employing a radically new type of missing-links graph, a pattern that I feel able to recommend as a suitably tortuous representation of a year through which there is no clear path for many communities and nations. I’ve illustrated all these designs against skies that at this time of year represent a Shepherd’s warning. I’ve only just discovered MathsJam, which may be meeting at a pub near you on the last but one Tuesday of each month, with Tuesday 13th.December 2016 a pre-Christmas exception. 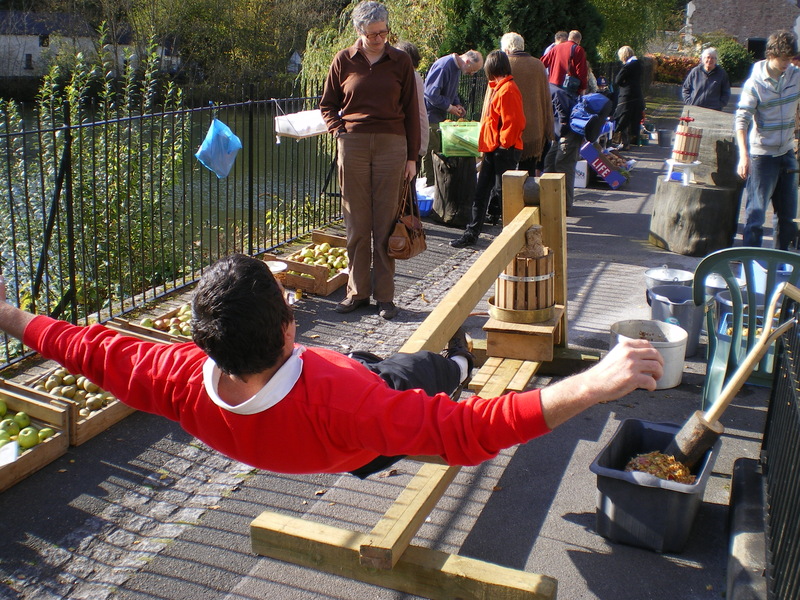 Here’s the MathsJam twitter site and a list of cities and other places where MathsJam is probably currently active; my personal centre is Nottingham, meeting at the Crafty Crow, opposite the Castle gateway. Each month, Katie Steckles co-ordinates and issues a MathsJam SHOUT – a page of problems and puzzles to break any ice at your meeting. Here is a recent example and here is another. (Those two links are to dropbox – they did eventually appear for me without attempts to sign in with mis-remembered details and I did manage to print them off as A4 sheets.) The October sheet occupied me happily for an hour or more on a broken-down train to Nottingham for a meeting I consequently never made. 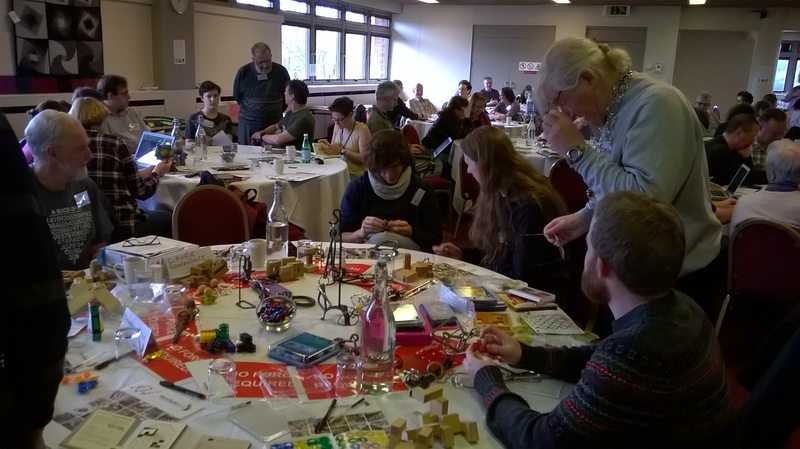 The annual MathsJam Conference at Yarnfield Park, Staffordshire, was a great treat. More than fifty talks were presented over the two days – each limited to just FIVE MINUTES after which escalating audio penalties are applied, and with just ONE MINUTE set-up time. After a batch of six or seven talks there is a coffee break during which the recent lecturers remain available to talk to. 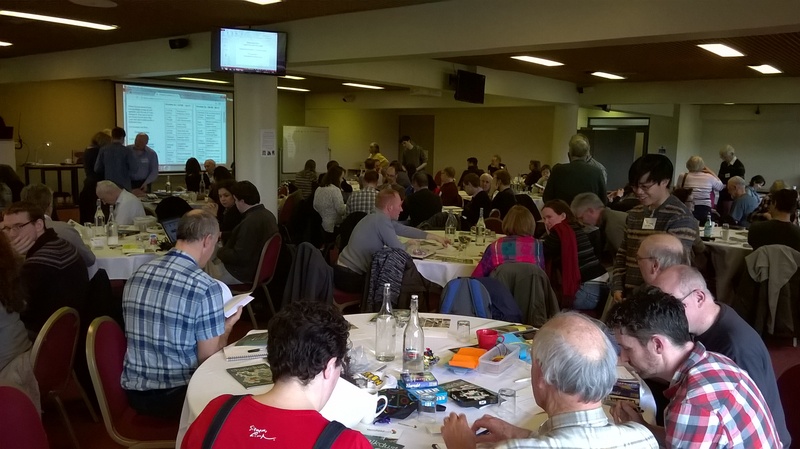 Delegates seat themselves at round tables, many strewn with mathematical games and puzzles, which makes for a very sociable time. 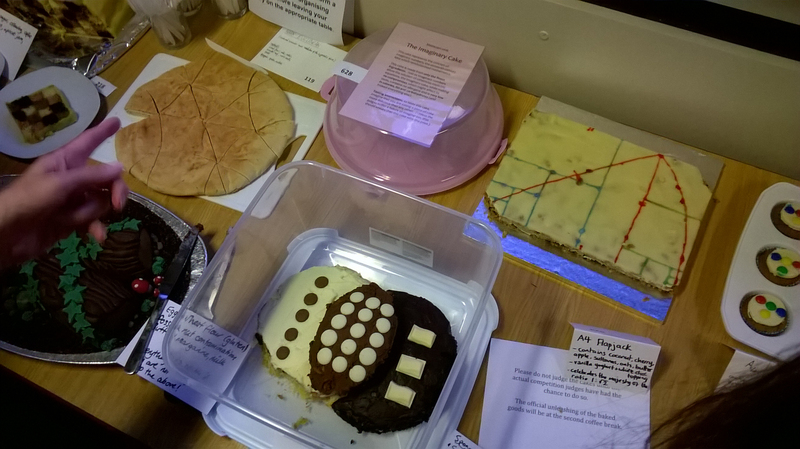 Under the windows were arrays of free books, craft exhibits, a T-shirt competition, mathematical cakes competition, activities and puzzles competition,a competition for the best competion breaking the competition rules and arching over all a competition for the best competition. Next year we are threatened with a competition for the best best of competitions competition. I think I’ve got that right. 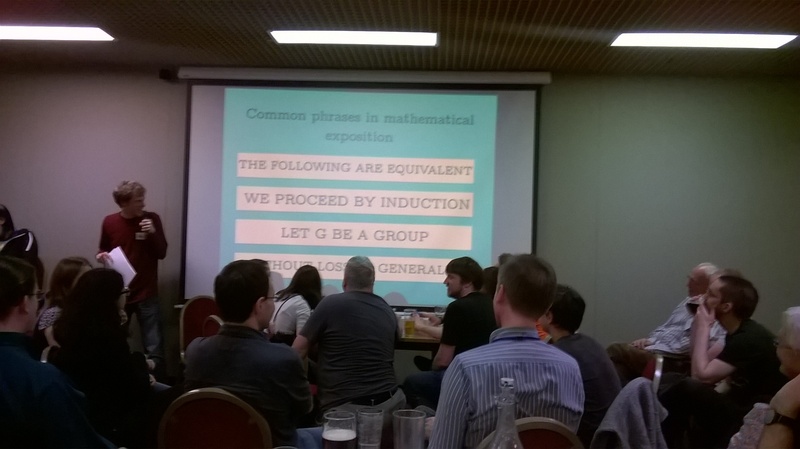 There was lots of laughter, generated by a very un-nerd-like array of stand-up mathematicians of all ages. After an excellent serve-yourself and seat yourself dinner there was an evening of activities, a quiz and mathematical musical jam session..
give you a flavour of that. Summaries and slides of the talks at the 2015 conference are already online and those for 2016 will be posted soon. 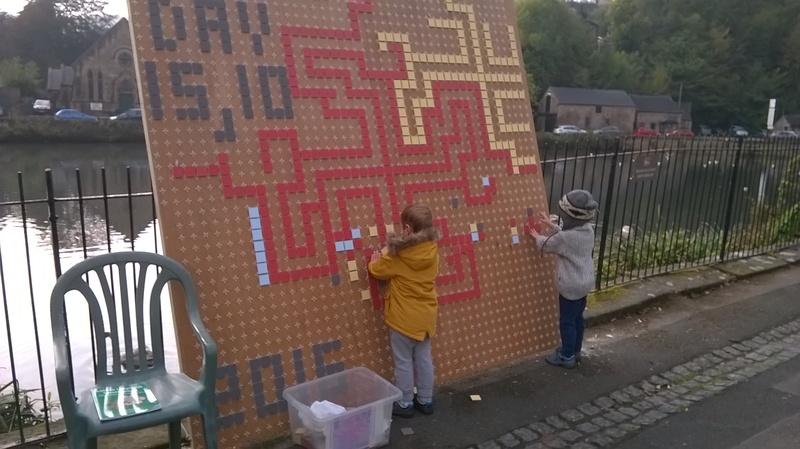 Here are a few pictures from 2016, including the answers to an anagram (or was it an acronym) competition. Thanks to the organisers, presenters, moderators, lift-givers, microphone-fitters and all who made MathsJam 2016 go so far as I know without a serious flaw. 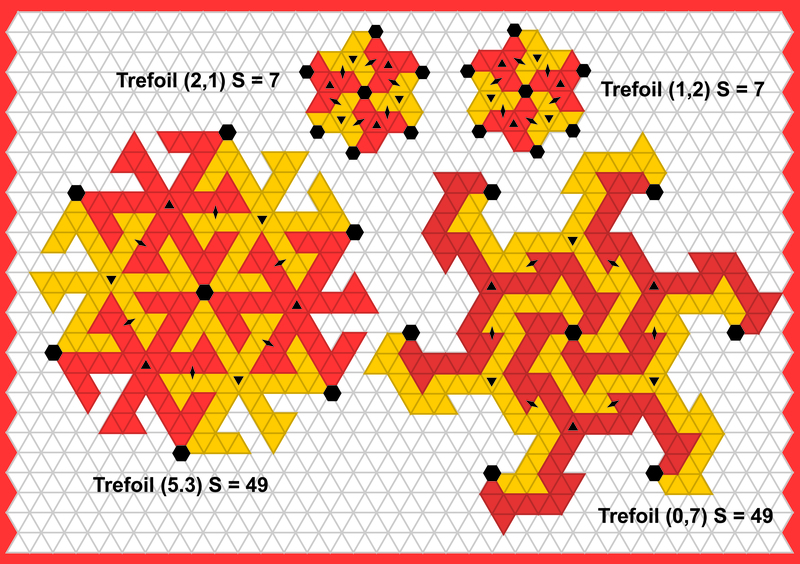 Finally, of course, here are my tessellations for the two days of the conference, November 12th. 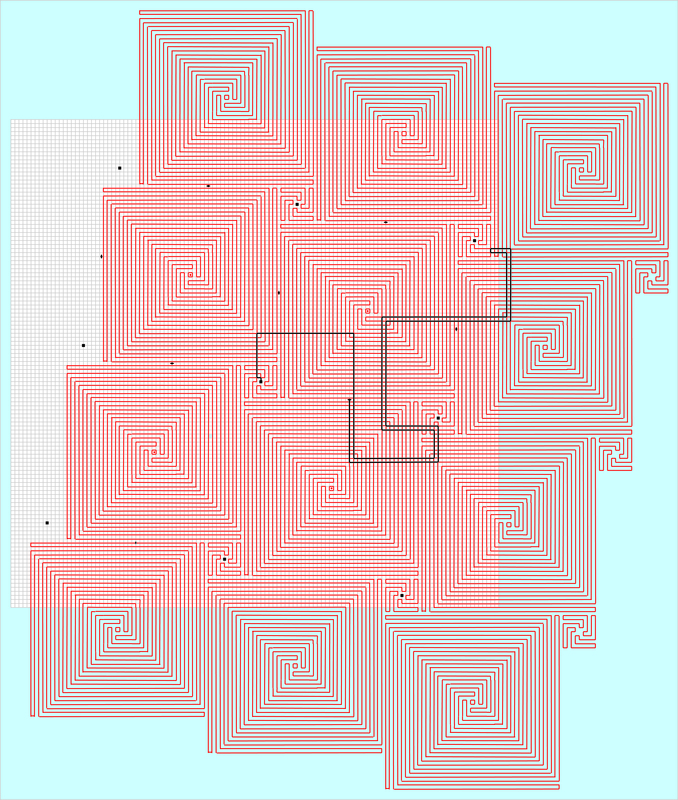 and 13th., Chinese Labyrinth (11,12) and Serpentine Labyrinth (13,11) each constructed via non-standard missing-links graphs in a quest for more intricate and less swastikoid forms. In the second example the illustrated missing links graph is itself swastikoid. Finding such graphs that work is helped by some experience and requires some “tweaking”.